Hot tub shell material varies depending on spa manufacturer and price class of the hot tub. For high end spa shells, two leaders have emerged as manufacturers of hot tub shell material: Lucite and Aristech acrylics. Lower end spas may even use vinyl and other soft-sided materials as found in the inflatable spa class. Inflatable spas are the most lightweight and thus truly portable spas. These are usually round and can roll into place and plug in to a standard 110V outlet. Some caveats of vinyl is that it may discolour if subject to harsh chemicals or out of balance water. It may also tear but many tears can be repaired similar to a bicycle tire repair job. Repair patches are sometimes included with these type of spas just in case. Acrylic shells come in several different varieties from the two largest hot tub acrylic shell manufacturers Lucite and Aristech. Lower cost acrylic comes in plain sheets without any backing. Fiberglass is usually rolled on these type of sheets to form a more rigid shell. This is a more old-style manufacturing approach that is still in use today, but involves quickly rolling fiberglass before it dries. This production method is less environmentally friendly than others. Caveats of using unbacked, thin acrylic is that the acrylic becomes paper thin the deeper the spa. Typically spas cannot be pulled too deep when using unbacked acrylic, so these type of spas may have a pedestal under the spa which makes the spa look deeper, but the actual legroom may not be as deep as it appears. Unbacked acrylic with rolled on fiberglass also has the possibility of having trapped air between the rolled on fiberglass and the acrylic sheet which can result in offgassing bubbles in the shell. Backed acrylic is the strongest spa shell material available. The ABS layer is bonded to the acrylic top layer forming a thick shell material that can be pulled to depths over 4 feet deep. This results in a thicker, more robust spa shell that is also typically more comfortable in the footwell as this type of material allows for deeper pulls. The process of bonding the acrylic sheet to the ABS layer is called extrusion. ABS backed acrylic shells come with either a rougher surface (Quarite) or smooth surface (shiny, marble acrylic colors). Both types made by Lucite and Aristech are resitant to chemicals, non-porous and very rugged. 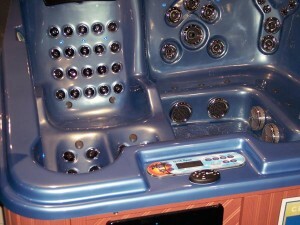 In a hot tub, most components can be replaced, but the spa shell is the one element that should last the longest. ABS backed acrylic spas should not be left out in the hot sun unfilled with water, or bubbles may form in the acrylic as the sun heats the shell material similar to when it was being thermoformed. Thermoformed plastic has memory and will try to go back to the flat state of the sheet if extremely heated. As long as a hot tub is full of water or covered, “sun bubbles” can be avoided. In the case acrylic is damaged, there are acrylic repair kits available with color matching depending on the color of the shell. There are other ways of making spa shells as well including the use of various other plastics, rotomolding and heat resistant plastics. Polyethelene is a low cost plastic used in some cheaper spas to keep the price down. This type of surface may also not stand up to harsh chemical use with discoloration being a possibility. Quarite ABS backed acrylic with the slightly rougher texture is slip-resistant, stain resistant and can easily be cleaned as it is non-porous. A simply scrubbing is enough to clean this type of surface. The smoother acrylic may show scratches more and require a polishing to restore luster. Some popular hot tub spa shell colors include: caribbean blue, tahoe, sahara, silver marble, white pearlescent, kalahari and other colors. The different manufacturers have different names for similar hues and color styles. 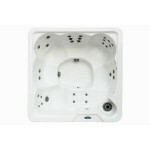 Hot tub shell materials have a wide price range to the hot tub manufacturer. Typically the lower cost materials can result in a lower priced hot tub. How durable and longlasting a hot tub spa should be is the choice of the consumer and may be related to the price of the unit. Hot tub pricing may range from $500 for a portable vinyl unit to $10,000 or more for a fully loaded ABS-backed acrylic spa.